Your doctor can help you find a treatment that will relieve your pain while not putting you at risk for relapse. Opiates, such as morphine, oxycodone and hydrocodone are commonly prescribed to people who suffer from chronic pain or a lingering pain following injury or surgical procedure. These drugs are prescribed without even thinking twice in most cases but what about those who are in recovery from codeine addiction – how is pain properly treated in those who are in recovery without hindering their success but also without leaving them to suffer in pain? Getting treatment for pain after you have already been addicted to drugs can be challenging and scary too. According the the American Psychiatric Association, “pain specialists said that treating patients in pain who are dependent on opioids involves a delicate balance between managing pain relief and risk of drug abuse.” The challenge is finding a way to provide effective treatment without placing the patient at undue risk of becoming further addicted. Fortunately, there are options that can be safe for you if you need treatment for pain following a codeine addiction. Be open and honest with your doctor about past drug use and abuse so that you and your health care professional can work out a suitable treatment plan that will have you feeling better without worry. A number of painkillers that are non-opioid can be prescribed to help you cope with pain following an injury or illness. There are anti-epileptic drugs, antidepressants and pain relievers that can be used to help. It’s usually a good idea to attempt a non-opioid pain treatment prior to attempting an opiate based pain relief technique. This allows you the chance to get help without risk. Both of these medications have powerful pain relieving effects and tend to carry less risk of physical dependence than other drugs such as Oxycodone or Hydrocodone. Remember, talk with your doctor about your previous opiate dependence before taking an opioid as there may be other medications or treatments that can work. Another way that you may be able to safely receive treatment for pain following codeine addiction is with the use of alternative treatments that do not include medication. Herbal remedies, nutrition, acupuncture, massage therapy and other techniques may be suitable for controlling or relieving pain without the use of medication in some cases. 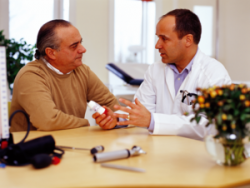 Talk with your healthcare professional about other options to eliminate pain without medication.